As a former teacher, if there's one thing I know about students during the Halloween season, it's that they certainly don't need even more candy from their teachers. (The struggle is real during this frightful season.) A great substitute for those children who are learning to read is a treat bag filled with different "spooky" read along pointers to use during their reading block or workshop time. You can easily pick up bulk bags of witches fingers, spider rings, and finger googly eyes at the local party store and Target cheaply. 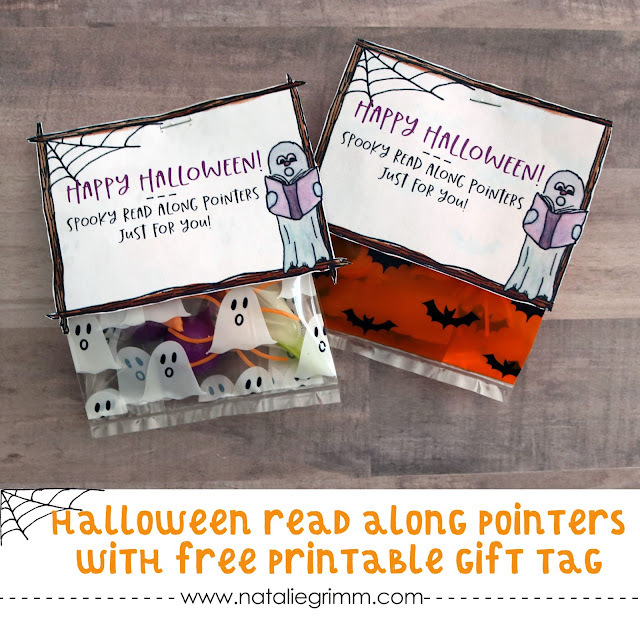 The rule here is basic: if it's Halloween-ish and can go on a finger it can be used as a read along pointer. Throw a few in a treat bag, staple on this cute tag (link below), and you're good to go! Happy Halloween to my teacher friends, and may next week be filled with extra naps and glasses of wine as you recover! Download the Printable Tags Here!